I last posted on this blog in January. It is now November. Rather than go on about how busy we've been, how quickly time goes by, or list off excuses for my absence, I figured I would just dive right into a recipe. We got rid of cable quite some time ago, and since then I have had to be creative to still get my fill of the types of shows I used to watch. America's Test Kitchen is great because it's on PBS and is similar in nature to the Food Network shows I love. 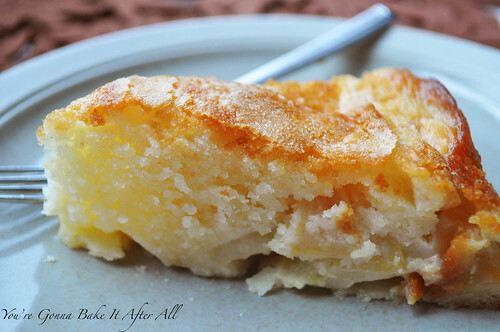 I saw this French Apple Cake featured on an episode this fall and almost immediately was in the kitchen making it. We had leftover apples from the orchard that needed to be used, and I just wasn't in the mood to make a pie. We really loved this cake. Because it's made with oil instead of butter, it's more moist than other homemade cakes. The bottom layer has a custard quality and contains the apples, and the top layer is more cake-like. The cake is topped with sugar before baking to give it a nice crispy topping, although once you wrap it up the moisture in the cake takes away this crispiness. I love that this cake is essentially one batter that is separated and then treated differently to create a custard layer and a cake layer. It just seems simpler than having two batters from the start. This cake cooks low and slow (1 1/4 hours!) so plan accordingly. I will say that I have loved having this blog as a way to document not only our favorite recipes but also momentous occasions in our family, and I have missed not having a record of these events in time-stamped format. Our daughter Ava is turning 2 next month !!! and I really cannot believe it. Also, we are expecting her baby sister in February and are so excited to see what life as a family of 4 brings! 1. Adjust an oven rack to the lower-middle position and heat the oven to 325F. Spray a 9-inch springform pan with non-stick spray. Place prepared pan on a rimmed baking sheet lined with aluminum foil. 2. Place apple slices into a microwave-safe pie plate, cover, and microwave until apples are pliable and slightly translucent, about 3 minutes. * Toss apple slices with Calvados and lemon juice and let cool for 15 minutes. 3. Whisk 1 cup flour, 1 cup granulated sugar, baking powder, and salt together in a bowl. Whisk egg, oil, milk, and vanilla together in a second bowl until smooth. Add dry ingredients to wet ingredients and whisk until just combined. Transfer 1 cup batter to a separate bowl and set aside (this will become the cake layer). 4. Add the egg yolks to the remaining batter (to create the custard layer) and whisk until just combined. Using spatula, gently fold in cooled apples. 5. Transfer custard/apple batter to prepared pan and, using an offset spatula, spread the batter evenly to the pan edges, gently pressing on the apples to create an even, compact layer, and smooth surface. 6. Whisk the remaining 2 tablespoons flour into the reserved batter. 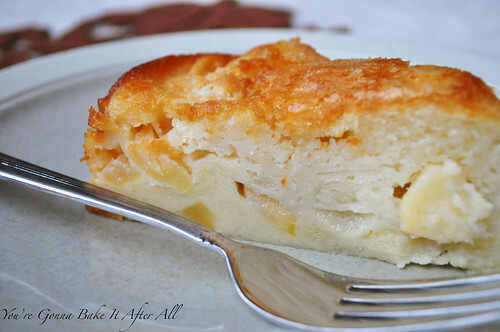 Carefully and evenly pour this batter in the pan on top of the custard/apple layer. Spread the batter evenly to the pan edges and smooth the surface. Sprinkle the remaining 1 tablespoon granulated sugar evenly over the cake. 7. Bake until the center of the cake is set, a toothpick inserted in the center comes out clean, and the top is golden brown, about 1 1/4 hours. *I prefer not to microwave plastic wrap as I'm unsure what chemicals leach into the food during the heating process, so I covered my pie plate with waxed paper then topped it with plastic wrap to get a good seal so no moisture would escape. I suppose chemical could pass through the wax paper, especially if had gotten wet (it didn't), but it made me feel better to do it this way! don't have a microwave oven could have sauted' them hovever these were apples that needed to be used... anyway my tart leaked from the springform some and well, it is to be brought into work these guys will eat anything! Very disappointed in this America's Test Kitchen recipe. The cake had no real custard base after baking. Did not "rise" either.